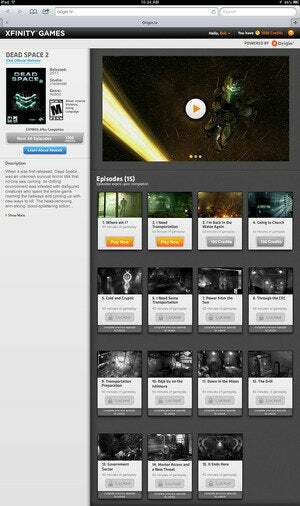 If OnLive can deliver games over your cable broadband, why not your cable provider itself? That appears to be the logic that Comcast, the nation’s largest cable service provider, is using, according to a Reuters report. Comcast is reportedly teaming up with Electronic Arts to stream games over your cable box using the new “X1” interface Comcast is rolling out nationwide. According to Reuters, five sources say that the program will be launched soon, after two years of testing. Many more details of that test were unveiled last year by Multichannel News, which reported that the X1 service would be powered by EA’s cloud delivery system, Origin. Comcast even deployed an iPad app that turned Apple’s tablet into a game controller during trials in late 2013. The service was referred to as “Xfinity Games Powered by Origin”. 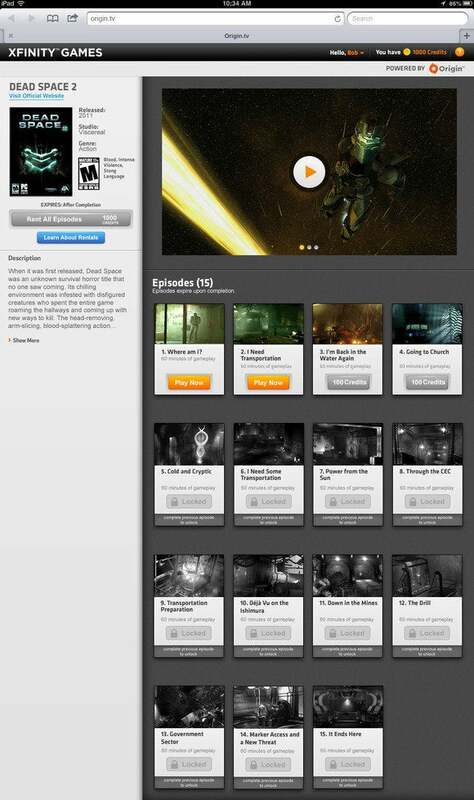 An example page showing episodes from Dead Space 2, allegedly on the Xfinity service. Lily Li, a user interface/user experience designer who claims to have worked on the project, offers even more detail. 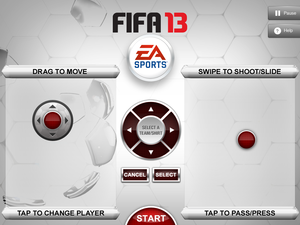 An example of an iPad “controller” for the Xfinity games project. That immediately places Comcast’s efforts on the order of a glorified in-flight entertainment system that you can play from your couch, rather than a service that would match up a nationwide network of eager “Battlefield” players. And yes, Reuters mentions that the Battlefield series of first-person shooters and the Madden series of virtual football games in its story, but without explicitly suggesting that they’re part of a potential package. What we do know, however, is that cloud gaming technologies such as OnLive do work; I’m a Comcast subscriber, and I’ve played through entire top-tier games on the service. What isn’t clear, however, is whether or not a relatively uncomplicated casual game (Hearts, for example) would be streamed over a network, or downloaded directly to the box itself. In any event, EA and Comcast appear to be readying the service for launch in the near future. How will this affect your cable bill? That’s probably the biggest unanswered question of all.